As you all know by now, Barbara Allan is the writing team of Barbara and Max Allan Collins. Their series about Brandy Borne and her "mom," Vivian, is one of the funniest going. In this one, Vivian talks a Russian heiress named Nastasya Petrova into donating a valuable Faberge egg to a church auction, where things go wrong. Really wrong. Nastasya winds up dead, and so does one of the bidders. Many of the other bidders are poisoned, though they don't die. Vivian, amateur sleuth that she is, swings into action, dragging Brandy along with her, not that Brandy needs much encouragement. She's as much into the investigation as Vivian. She's also off her medication (Prozac) because she's acting as a surrogate mother. That's just one of the interesting story arcs that runs through the series. Brandy also wonders about her and the mysterious letters that someone's sending. I'm sure we'll find out more about those things in the next book. 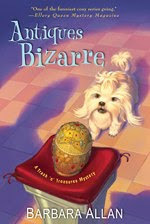 Meanwhile, if you need a laugh and enjoy a neatly plotted mystery with a lot of engaging characters and lots of snappy patter, not to mention a little romance, read Antiques Bizarre. Yes, It's True. I'm Everywhere. Dave Fisher, R. I. P.
Doris Eaton Travis, R. I. P.
The Handy Law Answer Book -- David L. Hudson, Jr. Need I Even Say It? If You Can't Come to Texas, . . .
Adele Mara, R. I. P.
Lena Horne, R. I. P.